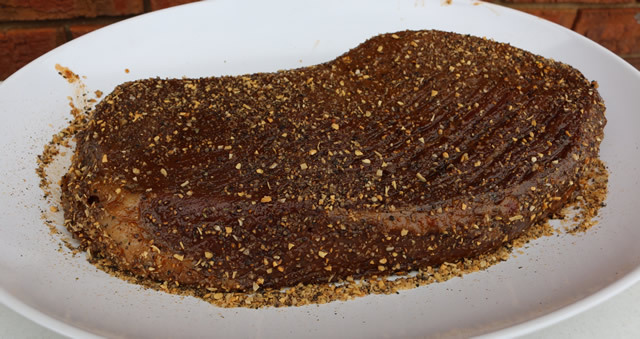 Recently I’ve had several questions asking how to cook a grilled London Broil. First let’s start off with what a London Broil roast actually is. In supermarkets you’ll see a 3-4lb roast labeled as London Broil. The name is really referring to the way it’s prepared not a specific cut of beef. 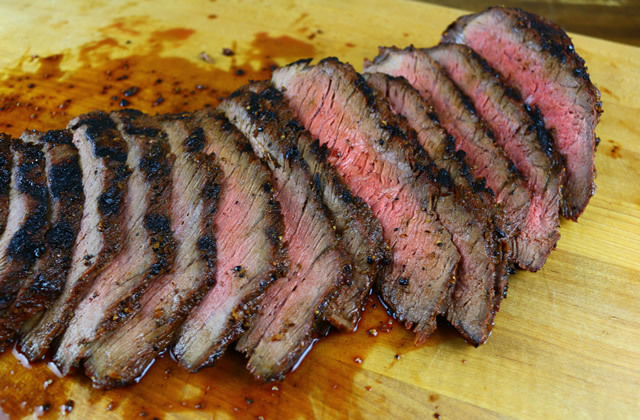 London Broil is typically a Top Round Roast or I’ve seen flank steak labeled this way. The standard preparation is to marinate the roast for several hours, brown the outside in a hot pan, and finish it off in the oven to a medium inside temperature. That’s traditional London Broil. For my version of grilled London broil I start with a 3.5lb roast purchased from the supermarket. The first thing I do is tenderize it on all sides using a jaccard. This will help the marinade penetrate the meat, and it also tenderizes it. After I used the jaccard, season the London Broil really well on all sides with my Killer Hogs The AP Rub. Then mix up the marinade and add to a XXL ziptop bag with the London Broil. After the London Broil has marinated for at least 4 hours (doesn’t hurt to go overnight), take it out of the marinade. Before it goes on the grill it needs a little more seasoning. 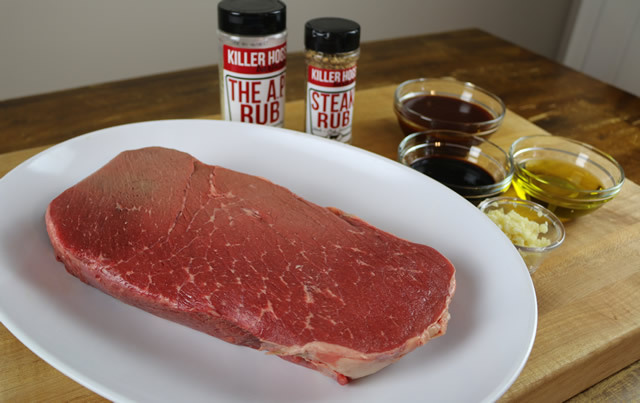 I like to use a course ground seasoning to create a nice crust – my Killer Hogs Steak & Chop Rub is perfect for this. Season the London Broil on all sides and allow to come up to room temp while you prepare your grill. For this cook, I’m using a reverse sear. You can use any grill you want, just set it up for a 2-zone fire – with one cool side and one hot side. I start my Big Green Egg cooking at around 250 – adding a couple pieces of hickory and pecan woods to give a good smoke flavor. Place the London Broil on the grill (cool side if you’re doing the 2 zone method) and monitor the internal temps. You want to pull the meat when it hits 110 internal. This is the first step in the reverse sear method. Once the grilled London Broil hits 110 internal, it’s time to sear it. You’ll need to take the roast off the grill and carefully remove the cooking grate and deflector shield. Be sure to wear hand protection here! Let the Egg come up to 500 degrees for high heat cooking – takes about 5 minutes. If you’re doing a 2 zone fire, you can just move the London Broil to the direct grilling side. Just make sure the coals are really hot. To sear, place the grilled London Broil back on the grate and cook it for 6 minutes each side – giving it a 45 degree rotation halfway through on each side to create some really cool grill marks. You’ll notice the grill grates I’m using on the egg. If you don’t have a set of these, you’re missing out. They really give the meat that restaurant-grilled look. Now it’s time to let it rest for about 15 minutes. Then slice against the grain – and I like to hold the knife at a slight angle to give slightly taller slices. Grilled London Broil is great served with mashed potatoes and a little brown gravy or it even makes great sliders!